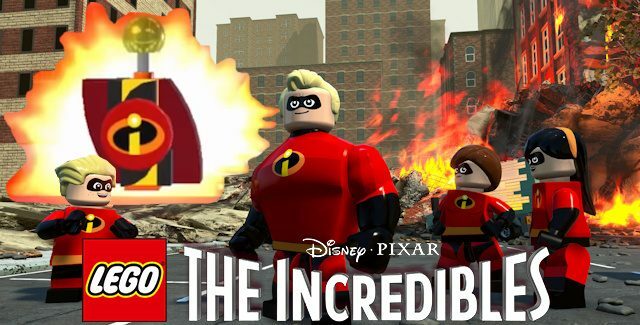 Welcome to the Lego The Incredibles Minikits locations guide that will show you where to find the total of 120 Minikits locations for the PS4, Xbox One, PC & Switch super action-adventure game. How to find missing Minikits? : In-game the Minikits will appear simply as a “Lego Mini Kit”, which looks like a red/black/yellow The Incredibles-themed logo (like the scubadiving air bottle in previous Lego games with bright red and yellow lights on the right side of it). It can be confirmed as being Minikits simply by walking into to it, as the on-screen counter will then tell you that you’ve collected another Minikit. As a bonus for finding all 10 Minikit locations in each of the 12 levels — making for 120 to collect in all — you will unlock a unique vehicle for each level. Collecting Tip: You can select Free Play to replay Story Missions, which allows you to use all characters you have unlocked. So after beating the game, first try to have as many characters unlocked (with all the abilities needed) before you go for many of these Minikits. — The start of each video shows the characters needed to find all 10 Minikits in said level. Note About Progress: You can track your Minikits collecting progress as you find each one, as the current count will then (for a few seconds) be indicated on the top-middle of your screen. — After you’ve completed each level the game will tell you, on a results-screen, how many Minikits you’ve picked up in total. * “Kit Car” (Bronze Trophy / 10 Gamerscore) — Collect all Minikits in a level. * “Kitted Up” (Silver Trophy / 30 Gamerscore) — Collect all Minikits in the game. Where to find all Minikits in Lego The Incredibles? The in-game collectibles locations for the Minikits are described in this detailed video guide with Camzillasmom’s handy voice-over tips. The Minikits are listed in the videos in the order that they appear normally. All 10 of the Minikit locations on the “Undermined” level of Story Mode are shown in this video guide. All 10 of the Minikit locations on the “Hover Train Hijinx” level of Story Mode are shown in this video guide. All 10 of the Minikit locations on the “Revelations” level of Story Mode are shown in this video guide. All 10 of the Minikit locations on the “Elastigirl on the Case” level of Story Mode are shown in this video guide. All 10 of the Minikit locations on the “House Parr-ty” level of Story Mode are shown in this video guide. Lego The Incredibles Minikits Locations Guide continues on Page 2 with Level 6.